Welcome to the home of the Renton Denture Clinic, Dr. Scott T. Andrews, and staff. 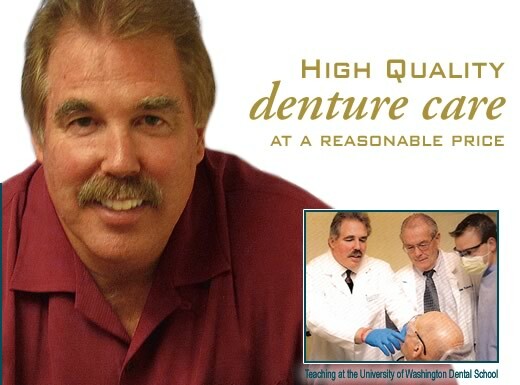 Renton Denture Clinic has been in business for over 31 years. Our goal is to bring high quality denture care to your needs for a low cost. Our work ethic brings dedicated professionals working for your benefit. From your first initial call to us, to arriving for your first appointment, we want you to encounter a very professional experience that puts you at ease. We like to educate our patients to bring them the best denture care options. We will discuss your denture problems or conditions and come up with the best treatment choices available. When you are finished listening to our denture plan options, you will have a better understanding on how to make objective dental decisions for achieving optimal level of dental health for your desired needs. When you arrive to our office, you will experience a very friendly atmosphere of professionalism to fit your needs. Dr. Andrews has done more than 31,000 dentures and partials over a 31 year time span. Dr. Andrews and staff will hear your needs and concerns and map out the best possible denture care to achieve the highest level of dental health for your needs. We have an in- house Denture laboratory to cater to the smallest minute detail, when making your new dentures or partials. When we make your new dentures/partials, we have a wax-try-in so you have absolute control of your new looks. The Dr. and his lab man are right there to help you every step of the way. The doctors make sure that the looks of your new dentures are very natural looking and your denture bite is perfect so you can enjoy life with your new teeth. We use the best denture materials to make sure that your denture is made with the utmost highest quality of care. Contact us today at (425) 271-7740. We genuinely hope that our website will be helpful to you in learning about our Denture practice, different treatment procedures, and the best dental recomendations for you. Please checkout our site and call us if you have any questions. © 2013 Renton Denture Clinic. All Rights Reserved.